Professor of English with specializations in 18th century British novels by women, Asian North American literature. Interest in life writing and digital media; Gabaldon's Outlander and other historical romances. Alisha Salvador (2016) is thrilled that the final paper she wrote for EN 252 Multiculturalism and Literature, taught by Dr. Mariam Pirbhai, will be published by LUJA: Laurier Undergraduate Journal of the Arts. My final paper was titled “Omnivore Perspectives of Food and Cultural Identity” and as the title suggests, it explores the relationship between food and one’s individual and cultural identity. As I was researching for additional articles to use in my paper, I came across Fischler’s “Incorporation Principle” and “Omnivore’s Paradox.” Fischler’s “Incorporation Principle” suggests how our physical features, behaviours, and identity are products of the food we consume. The “Omnivore’s Paradox” takes this principle one step further, and presents humans as ‘omnivores’ that tend to either embrace or fear the “incorporation” of other cultural cuisines based on the appreciation of either ethnic diversity or purity. I argued that throughout the novel Digging to America, Anne Tyler uses the leitmotif of food to illustrate instances of the “Omnivore’s Paradox” during intercultural encounters between two families, the Yazdans and the Donaldsons. This paper required a lot of time and effort due to the complexity of my chosen topic. I hope my paper will inspire students to challenge themselves and their writing abilities, to not be afraid of asking for help or utilizing the resources around them, and to develop a new understanding about the relationship between food and cultural identity. “I was intimidated by the uncertainty of pursuing a career in a competitive industry such as film and television so I initially enrolled in the Film Studies program as a solid second choice to film school—a safe bet. But my program ended up being the perfect foundation for my career in film. The program broadened my knowledge of film history and genre, exposed me to the formal language of cinema, its use as a social and political medium, and its hands-on editing course cemented my passion in filmmaking and motivated me to pursue film production after graduation. In the end, my experience was integral in supplying me with the foundational tools that has helped me become a well-rounded filmmaker and producer working in the industry today.” Priscilla is an Associate Producer at Blue Ice Pictures in Toronto and, currently, is producing and directing a dark comedy web-series, “How to Buy A Baby,” about an infertile couple going through fertility treatments. Check out the series teaser . Read about Priscilla’s web series about infertility in The Cord. During fall semester 2015, students have been sneaking around with plastic bags and surreptitiously slipping them to Dr. Hron or furtively smuggling them into her classes. What are these suspicious-looking packages? It all started when Dr. Madelaine Hron shared some of her experiences working in Rwandan prisons with her EN 313: West African Literature & Culture class. For a number of years now, Dr. Hron has been working with the small Canadian-based NGO, JustEquipping/Juste.Equipage , which runs various kinds of restorative justice projects in the Great Lakes Regions of Africa, especially projects related to prisons in Rwanda, the Democratic Republic of Congo and Burundi. Most notably, JustEquipping has encouraged more than 700 convicted killers of the 1994 genocide in Rwanda to write letters asking forgiveness of their victims. Local chaplains would then locate these victims and bring them these letters. Then, if the victims wished, the chaplains read them these letters, counseling the victims in their pain and grief. If the victims wanted, the chaplains would facilitate a face-to-face meeting with the killer in prison. Dr. Hron has seen and done some pretty amazing things with this group – for instance, she has played soccer with teens in prison, coddled the babies of female prisoners (women can have their children in prison until they are six years old), or celebrated mass beside dozens of convicted priests and bishops. Dr. Hron has witnessed a poignant victim meet with an offender for the first time, an offender who killed many members of the victim’s family. She has also visited a village where offenders and victims live together in peace. In one case, they live right across the street from each other, with the victims’ houses having been built by those who massacred their families. Women in Rwandan prisons suffer daily degradation – for instance, prisons do not even provide them with underwear or sanitary napkins. Ostracized and ashamed, most women dare not ask family or friends for such basic necessities. Dr. Hron explained that last time she traveled to Rwanda she collected underwear and sanitary napkins for these female prisoners. She wished she could undertake such a project again, since a local member of JustEquipping was leaving for Rwanda in January. Upon hearing that they could do something tangible to help these women, Dr. Hron’s EN313 class sprang into action. They wanted to provide each and every woman with a new pair of underwear for 2016. Dr. Hron was skeptical about this goal– there are more than 250 women in the Ruhengeri-Musanze prison… and there were only 26 students in her EN 313 class! However, nothing would deter these students – they spread the news and started bringing in underwear. Impressed, Dr. Hron then also recruited the help of her own friends, her EN/FS colleagues, as well as that of her large 160 person class, EN209 Fairy Tales. Soon, underwear starting piling up in Dr. Hron’s office, her car, her house… And by Christmas break, Dr. Hron counted that she had amassed more than 300 pairs of women’s undergarments! Amazing! Over the Christmas break, Dr. Hron carefully rolled them up, so that they would fit into a large suitcase (this rolling took more than 6 hours). 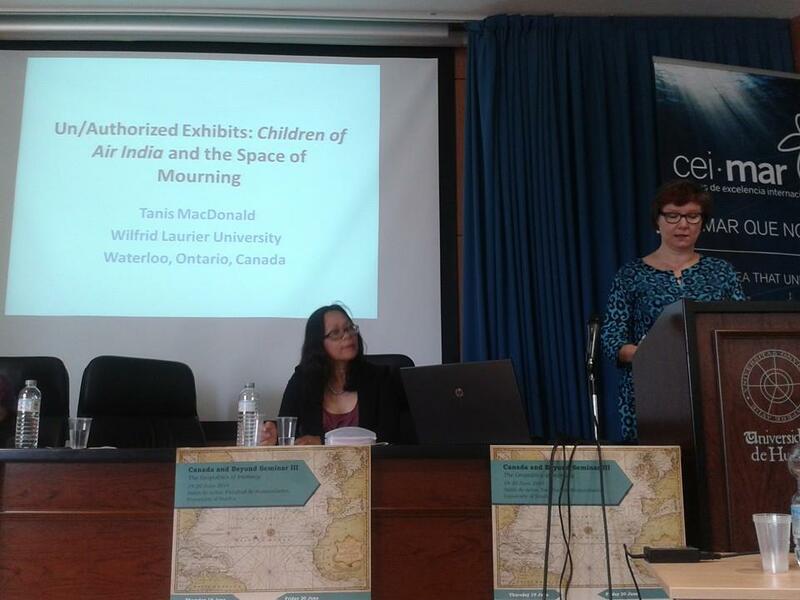 Tanis MacDonald and Eleanor Ty were invited to participate in the Canada and Beyond Seminar 3 at the University of Huelva, Spain from 19-20 June 2014 hosted by Pilar Cuder-Dominguez (Universidad de Huelva) and Belen Martin Lucas (Universidade de Vigo). About 20 scholars from Canada, Britain, and Europe gathered to talk about “the geopolitics of intimacy.” Other speakers included Cynthia Sugars (University of Ottawa), Winfried Siemerling (University of Waterloo), and writer/poet, Larissa Lai (CRC, University of Calgary). Tanis MacDonald’s “Unauthorized Exhibits: The Space of Mourning” argued that even when the elegy concerns familial loss, it can be political. Eleanor Ty’s “Intimacy, Violence, and Disruption in Monsieur Lazhar” looked at the parallels between familiar teacher and the stranger to reveal the connections triggered by unexpected violence. 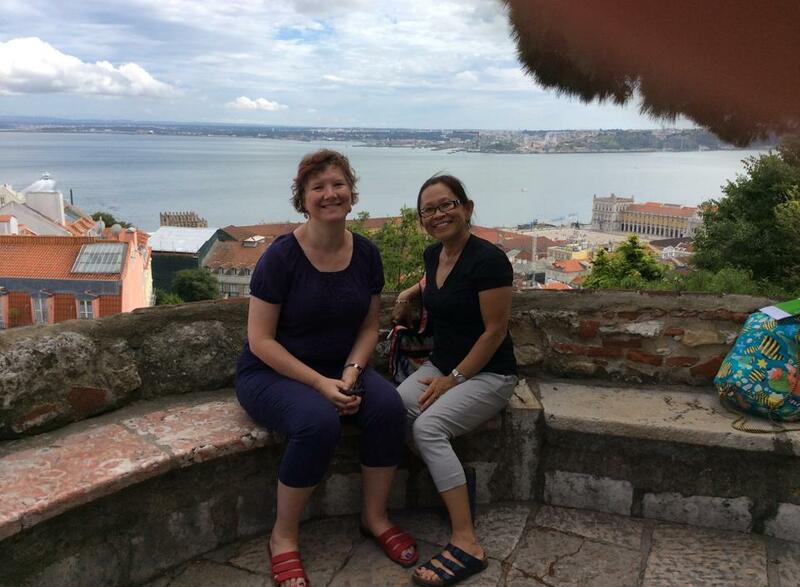 After the conference, they visited some castles and other sights.